The Sporting News, a 126-year old media property headquartered in North Carolina, has picked up an Ipswich startup founded just last year: FanTab, which collects data about how fans feel about the teams they follow. Terms of the acquisition aren't being disclosed. The Sporting News isn't retaining any FanTab employees, but FanTab at its peak had just three team members — one of whom, Rob Roesler, went to Constant Contact back in April. The company built widgets that enable any website to poll fans about how they feel about a team's prospects, and display the results as a "fan confidence" index. "The indexes are similar to stock quotes and are trackable over time, enabling marketers and franchises to see how fans actually feel about the team year-to-year or even day-to-day," explains co-founder Scott Cohen. 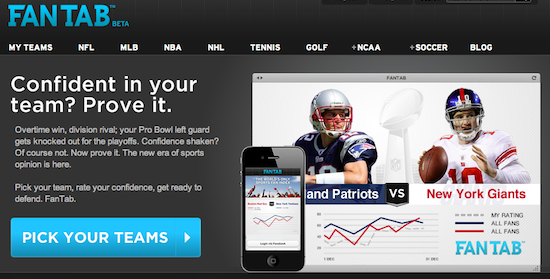 You can see FanTab's widget in the right-hand column of this Sporting News page, collecting data from Pats fans. (Confidence in this year's crew is almost 9 percent higher than it was this time in 2011.) Cohen says The Sporting News has plans to integrate the data more extensively throughout the site. FanTab never raised VC funding. It was founded in 2011 by Cohen and Frank Hertz, who were part of the team that built and launched Boston.com in the mid-90s, along with Roesler. I last covered FanTab in January of 2011, prior to its launch.